The Premier League season has hit the halfway mark and moves into 2015 with Chelsea at the top of the table and reigning champions Manchester City in hot pursuit. But anyone tempted to condemn the second half of the season to a predictable procession near the top may just hold back after Chelsea dropped points at Southampton and City were left even more frustrated as they lost a two-goal lead at home to Burnley. So, as the season enters its next phase, how will clubs and managers look back at the first 19 games and ahead to part two of the campaign? SEASON SO FAR: Mixed but ended on a high note with wins against QPR and West Ham United that moved them up to fifth in the Premier League. Still do not look like a side capable of turning over their closest rivals, as they have found out against Chelsea and Manchester United, but in a good position and into the Champions League knockout stages again. HOW IS THE MANAGER DOING? : Clearly not good enough for some. There was a banner demanding Wenger's departure after Arsenal's win at West Bromwich Albion and also angry scenes at a train station after the loss at Stoke. Wenger still manages to get the wins to keep the wolf from the door but still has serious issues to address - if he chooses to address them. Credit due for luring Alexis Sanchez to Arsenal. WHAT THEY NEED TO DO NEXT: Same old same old. A central defender of authority (maybe not someone who ducks out of the way of dangerous crosses such as Per Mertesacker did at Stoke and Liverpool) and also a commanding holding midfield player. But where will he find them in January? Also, any chance of injuries finally clearing up? Did you know? : Alexis Sanchez became the 100th player to score a Premier League goal for Arsenal (excluding own goals) when he netted against Leicester in August. SEASON SO FAR: Unspectacular. A fine start that brought wins at Stoke and Liverpool and a new contract for manager Paul Lambert has deteriorated into a mid-table scrap as well as seeing the departure of his No.2 Roy Keane. Villa's existence now seems to be ensuring they do not fall into relegation trouble. It is how their season is panning out - but surely a club of their stature should have higher aims. HOW IS THE MANAGER DOING? : The jury is out on Paul Lambert but he has not been given huge amount of room for manoeuvre in the transfer market by owner Randy Lerner, who has so far failed to sell the club. Like Villa's season - unspectacular. WHAT THEY NEED TO DO NEXT: Netherlands defender Ron Vlaar and England midfield man Fabian Delph are both free agents next summer. There is every chance one or two clubs might test their resolve to cash-in now rather than lose out in a few months. If Villa are to have any chance of prospering further this season, surely they must make sure they survive January without sales. Did you know? : The Villains have received a joint-high four red cards in the Premier League so far this season. They didn't receive a single red card in 2013-14. SEASON SO FAR: Upward curve. It took Burnley 11 games to get their first win against Hull City but since then they have shown they have the character and commitment to make a real go of trying to stay in the Premier League. If you need evidence, look at the comeback from two goals down to draw at champions Manchester City. HOW IS THE MANAGER DOING? : Without big finance, and while also having to manage the sort of start that would have killed the spirit of most newly-promoted teams, Sean Dyche has done superbly. He never lost faith, never criticised players who were giving him everything, and is now reaping some rewards for that fine management. WHAT THEY NEED TO DO NEXT: Like other clubs near the bottom, the main priority is to keep their best players, especially goalscorers such as Danny Ings. In Burnley's context he could be priceless at season's end. SEASON SO FAR: Outstanding. Just one league defeat so far, at Newcastle, and a real show of strength built on Jose Mourinho's two stellar summer signings Cesc Fabregas and Diego Costa. Costa has scored 13 league goals and Fabregas has created 13 league goals. Sound investment. HOW IS THE MANAGER DOING? : Mourinho's expertise has been on show again, moulding the exciting skills of Costa, Fabregas and Hazard with the powerhouse Nemanja Matic and old reliables such as captain John Terry. A perfect blend of silk and steel. Still the consummate coach, although starting to see some conspiracy theories after Fabregas was refused a penalty at Southampton. WHAT THEY NEED TO DO NEXT: Not a lot other than keep the likes of Diego Costa and John Terry fit - and keep looking in their rear view mirror at Manchester City, who they play at Stamford Bridge in January. Did you know? : Cesc Fabregas collected his 13th assist of the campaign against Southampton, setting a new record for most assists in a player's first 18 games of a season. This also equalled the most assists by a player in the 2013-14 season (Steven Gerrard). SEASON SO FAR: Turmoil. From the departure of Tony Pulis, who brilliantly engineered Palace's survival last season, 48 hours before the start of the season, to the sacking of Neil Warnock, there has been an instability around Selhurst Park that has been reflected in results. This needs to change. Fast. HOW IS THE MANAGER DOING? : How WAS the manager doing? Warnock's sacking answers that one - and his eventual replacement will need to hit the ground running and perform some Pulis-style wizardry. WHAT THEY NEED TO DO NEXT: Appoint a manager. A Pulis identikit. Did you know? : Three different managers (Tony Pulis, Neil Warnock and caretaker manager Keith Millen) have led Palace over their last 20 Premier League games. SEASON SO FAR: Bitterly disappointing after finishing fifth last season and coming so close to pipping Arsenal to a Champions League place. The spark has gone and there has been a lack of urgency and goal threat that has caused problems - ally this to a tendency to concede soft goals and there is not much good news around. Excellent progress in the Europa League though. HOW IS THE MANAGER DOING? : Martinez was a hero to Everton's fans last season but he has been the subject of very heavy criticism in recent weeks, particularly for a playing style that relies on passing almost to the exclusion of everything else. It has led to too many dull games and too many defeats. There are huge games now away to Hull City and at home to West Ham United in the FA Cup as Martinez faces some fan unrest and the first serious questions of his time at Goodison Park. WHAT THEY NEED TO DO NEXT: Ask the vast majority of Everton fans and the buzz-phrase answer will be "Plan B". Martinez's Everton appear to have been worked out by opponents and he must somehow find an alternative. May also need a new goalkeeper to replace fading Tim Howard and also find something to ignite £28m striker Romelu Lukaku. Did you know? : The Toffees have made 10 errors leading to goals this season - four more than any other side. SEASON SO FAR: Struggle. The light provided by the win at Sunderland was replaced by the darkness of a home defeat by fellow strugglers Leicester City. Results this year have been poor but a busy summer in the transfer market, including the £10m club record signing Abel Hernandez, after reaching the FA Cup final, pitched expectations higher than what has been delivered. HOW IS THE MANAGER DOING? : Steve Bruce has looked nonplussed at his side's struggles and his loan signing of Hatem Ben Arfa has not worked out. Bruce, however, is a manager of wide experience and few would back against him leading Hull to safety - but these are troubling times. WHAT THEY NEED TO DO NEXT: Needs to get Hernandez firing and Nikica Jelavic playing to his full potential and get some goals. Bruce made the point that in Hull's position they simply cannot create, then miss, as many chances as they did in the defeat by Leicester. Owner Assem Allam has been willing to provide financial support so there should be business in January. Did you know? : The Tigers have picked up just six points at home so far this season (one win, three draws); the lowest in the division. SEASON SO FAR: Poor - but suddenly lifted by the win at Hull City. The spectacular 5-3 win against Manchester United was a rare shaft of light. Manager Nigel Pearson has said on many occasions that performances were not getting the rewards they deserved - he must hope that first win in 99 days (since the victory against United) is the start of the reversal of that process. HOW IS THE MANAGER DOING? : Been an interesting season to say the least for Pearson, but that win at the KC Stadium will have lifted some personal pressure. May need to build a bridge after he was fined £10,000 by the FA and handed a one-match touchline ban after accepting a charge of using "abusive and/or insulting words towards a spectator" in the 3-1 home defeat by Liverpool - although plenty of other managers had sympathy for him. WHAT THEY NEED TO DO NEXT: Build on that win - and perhaps target a central defender and a striker to give the Foxes a more resolute defence and a greater goal threat. Morale suddenly higher though. Did you know? : Leicester became the first team to come from two goals down to beat Manchester United in the Premier League in their 5-3 victory over them in September. SEASON SO FAR: Disappointing. From the high of almost winning their first title in 24 years last season to just scraping into the top half of the table so far this term. With Luis Suarez sold to Barcelona and Daniel Sturridge injured since August, they have looked a shadow of that thrilling team. Some signs, though, that a little form may be returning and Sturridge should be back in January. A dismal Champions League group campaign, with only one win and an early exit, is a real scar. HOW IS THE MANAGER DOING? : Tough times for LMA Manager of the Year Brendan Rodgers - although talk his job should be under discussion six months after almost winning the title is unfair. Has struggled to integrate new signings and has on occasion not seemed to know his best side, although he has had to juggle to find a formula. WHAT THEY NEED TO DO NEXT: Decide whether Mario Balotelli is worth the bother (probably not), sign a new goalkeeper to replace the erratic Simon Mignolet and find the magical medical formula that actually keeps Daniel Sturridge fit. Did you know? : The Reds have scored 22 goals after 18 games so far this season. They had scored 43 after the same amount of matches in 2013-14. SEASON SO FAR: Denied a club record 10th successive win in all competitions as they lost that two-goal lead at home to Burnley but have shown signs recently of being back to their best, even without Sergio Aguero. David Silva is fit again and the confidence gained from reaching the knockout phase of the Champions League should not be under-estimated. HOW IS THE MANAGER DOING? : Typical Manuel Pellegrini, under-stated, modest and under the radar. But this is a manager who would like nothing better than to outflank his old adversary Jose Mourinho and he will feel City are in position to do it. WHAT THEY NEED TO DO NEXT: Like Chelsea, there should be no major work in January but everyone at the Etihad will keep everything crossed that the world-class Sergio Aguero finally has a long run without injuries. He could yet be the title game-changer. Did you know? : Frank Lampard's goal against Leicester in December was his 175th in the Premier League, putting him level with Thierry Henry. Only Alan Shearer, Andy Cole and Wayne Rooney have scored more. SEASON SO FAR: Getting back to something like the old Manchester United before the dark months of the David Moyes era. Definite signs that the Old Trafford juggernaut is moving in the right direction again under Louis van Gaal. Title talk is highly ambitious but top four and a return to the Champions League is a definite possibility. HOW IS THE MANAGER DOING? : Exactly as you would expect from someone of Van Gaal's experience and success. A man undaunted, unlike Moyes, by the scale of Manchester United with firm beliefs in his approach and the authority to command complete respect from his players. WHAT THEY NEED TO DO NEXT: United need to shore up a defence that gives away too many chances, which may be helped by clearing an over-crowded treatment room. These will be the priorities for the second half of the season. Did you know? : United have used a league-high 31 players so far this season, one more than they did in the whole of 2013-14. SEASON SO FAR: Top 10 is a very fair return for Newcastle after the 3-2 win against Everton. Usual basket case of a season as fans called for manager Alan Pardew's sacking even as they went through a good spell, with the year ending with him being linked to former club Crystal Palace. HOW IS THE MANAGER DOING? : Pardew may not be everyone's cup of tea but no-one should doubt his strength of character by cutting through fan unrest to continue to do a sound job at Newcastle United. This is not said very often but also credit to Newcastle owner Mike Ashley for refusing to give in to fan pressure. WHAT THEY NEED TO DO NEXT: Midfield man Moussa Sissoko has been heavily linked with Arsenal. Newcastle have been tempted to cash in on prize assets before - it would be nice for the Toon Army if on this occasion there was resistance. Did you know? : Papiss Cisse has scored a league-high five goals as a substitute this season. The most in 2013-14 was four (Dwight Gayle). SEASON SO FAR: At home good, away bad. QPR are a team than can play with real verve at times but too often disappear away from Loftus Road. Manager Harry Redknapp must know the losing streak away from home cannot be allowed to continue - it is high-risk should the home form fail. HOW IS THE MANAGER DOING? : Redknapp's lot these days is simply keeping QPR up - there is no great expectation of trophies or finishing in the upper reaches of the Premier League. He looks capable of doing that - but will he eventually think that he wants more at this late stage of his career? WHAT THEY NEED TO DO NEXT: Very easy. Keep hold of talismanic striker Charlie Austin - who must be on the brink of England recognition - in January and find a way to win away from home. This could decide their fate this season. Did you know? : Harry Redknapp's side became the first since Bolton in 1995-96 to lose their opening nine away games in a Premier League season. SEASON SO FAR: The season's surprise package - a delight. Tipped for virtual extinction by some after a summer exodus in which Adam Lallana, Dejan Lovren and Rickie Lambert went to Liverpool, Luke Shaw to Manchester United and Calum Chambers to Arsenal. Instead, with signings such as Dusan Tadic and Graziano Pelle, as well as the sure touch of manager Ronald Koeman, they have emerged stronger. A lesson in sound management. HOW IS THE MANAGER DOING? : Brilliantly. Koeman's calm approach, even after a run of defeats recently, saw Saints turn the tide with wins against Everton and Crystal Palace and a fine draw against Chelsea. Cool and with a flexible tactical approach, the man who worked alongside Van Gaal and Mourinho at Barcelona is an excellent addition to the Premier League after replacing Mauricio Pochettino. WHAT THEY NEED TO DO NEXT: Make sure they do not lose any more players - and why would they want to leave with Southampton in the top four? They may look at the likes of Lovren and Lambert, who have found the grass is not always greener. Did you know? : Thirty-three points from 19 games is the best start to a Premier League season by Southampton. SEASON SO FAR: More fine consolidation under Mark Hughes, with excellent wins at Manchester City, Spurs and Everton. This is a side who has every chance of finishing in the top half of the table and one no top side will relish facing. HOW IS THE MANAGER DOING? : Hughes has done an excellent job in succession to Tony Pulis, finishing ninth last season and moving towards something similar this time around. He has ensured there was no fall-off from last season. WHAT THEY NEED TO DO NEXT: Strangely for a team that plays in one of the most atmospheric, intimidating arenas in the Premier League, Stoke have occasionally looked more at home on their travels than at the Britannia Stadium. Cure this and there could be further progress after the turn of the year. Did you know? : The Potters have scored just seven goals in the second half this season. Only Aston Villa (2) have scored fewer. SEASON SO FAR: Mixed bag. Summed up in the space of a few days by a win at Newcastle United in the Tyne-Wear derby then losing disappointingly at home to Hull City. Will want to guard against the possibility of dropping into the sort of relegation scrap they did so magnificently to get out of last season. HOW IS THE MANAGER DOING? : Gus Poyet is probably doing what is required of him, which is keeping Sunderland's heads above water. Still in huge credit for keeping them up last season and the win over Newcastle never does a manager any harm. WHAT THEY NEED TO DO NEXT: May need more of a goal threat but there is not a colossal budget - so Sunderland may have to set their sights lower than Fabio Borini, who did so well on loan last season but declined to move from Liverpool to the Stadium of Light in the summer. Did you know? : Sunderland's 11 draws after 19 Premier League games is a joint-record with Ipswich (1992-93). The Black Cats only drew eight games in the whole of 2013/14. SEASON SO FAR: Very steady and fully deserving of a place in the top 10 ahead of the visit to Liverpool. Solid without being spectacular but possess real goal threats in the shape of Wilfried Bony and Gylfi Sigurdsson. HOW IS THE MANAGER DOING? : Garry Monk is growing into the job vacated by Michael Laudrup. Built on his work from last season and looks to be maturing as a manager. WHAT THEY NEED TO DO NEXT: Keep Bony away from any transfer predators. His goals mean so much to Swansea City, a powerful striker opponents fear. Did you know? : Bony is the Premier League's top scorer in 2014 (20, before Monday night's game). SEASON SO FAR: A slow burner but Spurs are nicely placed in seventh after the draw at home to Manchester United. Harry Kane has been a revelation and Christian Eriksen is a match-winner. Shown great resilience to late wins at West Ham, Aston Villa, Hull City and Swansea City. HOW IS THE MANAGER DOING? : Mauricio Pochettino's approach is slowly taking shape - his emphasis on physical fitness is certainly being rewarded with those late victories. Interesting to see if he makes serious moves to strengthen his squad in January. WHAT THEY NEED TO DO NEXT: Need to find more goals if they are to press on towards the top four places. Too much reliance on Kane and Eriksen with Roberto Soldado and Emmanuel Adebayor not producing this season. Saido Berahino from West Brom perhaps? Did you know? : Tottenham have given away more penalties than any other side this season (five). SEASON SO FAR: Painful. The Baggies have had few moments of joy this season, wins at Spurs and at home to great rivals Aston Villa have lifted the siege but this looks like it will be a campaign akin to a footballing war of attrition. HOW IS THE MANAGER DOING? : Not very well, sadly. Alan Irvine is one of the game's true gentlemen but he failed as a manager at Preston North End and Sheffield Wednesday and looks doomed unless something dramatic happens at The Hawthorns. He was not an appointment to inspire the fans after Pepe Mel and the fans are understandably in a dark mood. Irvine is superb as a coach or academy director - but is he a manager? 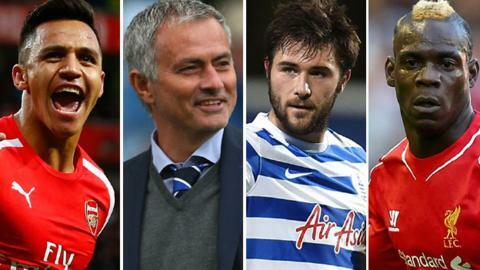 WHAT THEY NEED TO DO NEXT: It may be the most painful option of all - a change of manager. Sad if it comes to that but alarm bells are ringing after those defeats by QPR (losing a two-goal lead) Manchester City and Stoke City. Did you know? : The Baggies are the only side yet to score a left-footed goal in the Premier League this season. SEASON SO FAR: The year took a bit of a late dip with defeats to Chelsea and Arsenal but this sixth place was dreamland to West Ham fans before the start of the season. HOW IS THE MANAGER DOING? : Sam Allardyce will no doubt tell you how well he is doing - and he would be absolutely right to do so. The demands from co-owners David Sullivan and David Gold for more attractive, attacking football have been met with the introduction of Enner Valencia and Diafra Sakho, while Stewart Downing has been revitalised. Now can he keep it going? WHAT THEY NEED TO DO NEXT: Keep hold of Winston Reid, who has not signed a new contract and may attract admiring glances throughout January. Will Allardyce also prioritise the league over the FA Cup, with a third-round tie on the way at Everton? Did you know? : The Hammers have scored a league-high 13 headed goals so far this season. Indeed, they have never scored more in a single Premier League campaign (also 13 in 2009-10). Who is moving where in January? Read more on Transfer window: Strootman, Shaqiri, Balotelli on the move?